This was not my first choice of bike to do this to, but I came at the right price. So I thought I would give it a go. It’s a 1981 Honda cb900f. 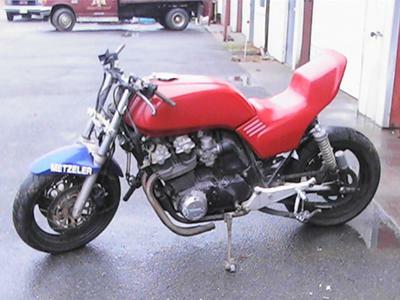 So far it has 94 Suzuki rf600r forks, 17" wheels, rear sets and brakes. This is my winter project build but it's looking like it will be done way ahead of schedule. The seat is a one off hand crafted, using the rear seat cowl and the side panels to create a one piece unit.